At the Technical University of Delft, the Netherlands, an ultralight, human powered airplane is being constructed. Since May 2004 M5 Recumbents sponsors this remarkable initiative by providing knowledge, material, financial support and... the pilot! When the plane is completed Bram Moens wil make the record attempt himself! Note that Bram will be 50 years of age by then. Nevertheless Bram is a suitable candidate thanks to the optimal balance between muscle mass and body weight and thanks to the continuous high power he can deliver during a long period. The plane will participate in the "Kremer International Marathon Competition". It's held in England near London. There's a price of 50.000 English Pounds for the first successful flight over 42 kilometres within one hour. The price is after 20 years of attempts still not claimed! M5 has sponsored two M5 26/20 low bar bikes to a remarkable initiative: a journey over 12,000 kilometres through central Asia. On the internetsite of the Central Asia Bike Ride a lot of reports en many spectaculair pictures of this remarkable journey. With a final trip to Hong Kong the 12.000 km journey of Chris en Nathalie Hatherly is concluded. The Central Asian Bike Ride was an unforgettable expedition with extraordinary experiences, with tough roads and untamed nature. 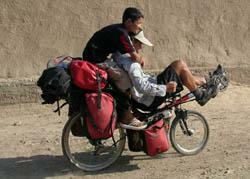 According to Chris and Nathalie the two by M5 Recumbents sponsored M5 26/20 bikes have endured the ordeal excellent. The minor problems with the carriers might be the result of a slightly exceeding the maximum loading capacity!